Belarus has ordered new combat aircraft from Russia, according to the commander of Belarus' Air Force and Air Defense Forces. Major General Oleg Dvigalev said the country has signed two contracts for four Russian Yakolev Yak-130 Mitten trainer/strike aircraft. He also confirmed that an order for 12 Mil Mi-8MTV-5 Hip helicopters had been signed in June, the BelTA news agency reported. 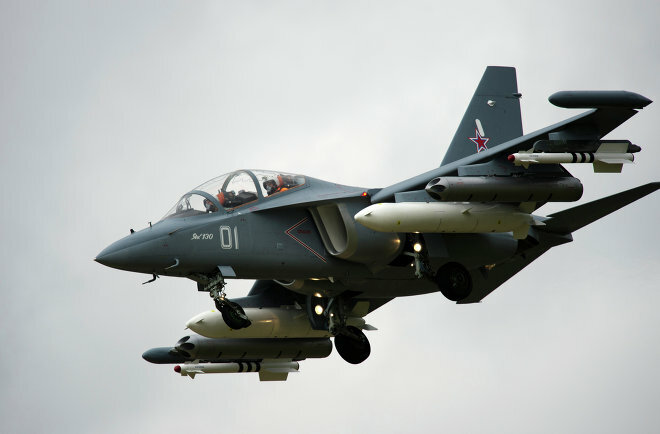 Upon delivery, Belarus will have a fleet of eight Yak-130s. Four of the aircraft Belarus ordered in 2012 were delivered in April. Major General Dvigalev said "four instructor pilots are already preparing the 116th assault air base to fly the Yak-130," adding that "about 10 pilots will be prepared this year." By 2020 the Yak-130 will have entirely replaced the Aero Vodochody L-39 Albatross in Belorussian service, he added, according to IHS Jane's. The Yak-130 is an advanced pilot training aircraft that replicates the characteristics of 4+ generation fighters, including the Su-30, MiG-29, Eurofighter Typhoon, Rafale, F-22 and the F-35. The plane made its maiden flight in 1996 and entered service in 2010. It has a number of outstanding characteristics: its cockpit is equipped with digital indicators; it can perform flights in nearly all regimes similar to modern and projected combat planes. The construction of its air scoops and gear enable it to take off even from small grass airfields. Moreover, the tiny plane can carry enough ammunition to deliver a devastating payload – up to three tons of bombs, missiles, rockets, and gun pods.